I love soccer. I love to play the game, I love to watch the game, and I am fascinated by the social impact it has on entire countries. But even with all my love, there is one aspect I have a hard time backing. It’s been a week since the Major League Soccer Cup was played in Seattle, and it’s taken that much time for me to give the game any kind of attention. My emotions have been so mixed about the outcome: I am not too happy about the final result even though my home team came back with the championship. In what should have been a classic Cinderella story, where the last place team beat the superstars from Los Angeles, the entire outcome was decided by a penalty shootout. In the end the better team hoisted the trophy, but to know everything hinged on who made more goals in the shootout was beyond frustrating. Early in the game David Beckham crossed a beautiful ball into the attacking third of the field, where Landon Donovan passed it off for a quick shot into the goal. Los Angeles went up 1-0, and they definitely had more momentum than Real Salt Lake. The Galaxy seemed sharper, faster and hungrier for the win. It was becoming clearer as the seconds ticked away that the Galaxy would be this year’s MLS Cup champs, again. Salt Lake would be turned away from a championship one more time, something we are used to after 20 plus years with the Jazz always falling just short. Soon after their first goal Los Angeles checked out of the game. 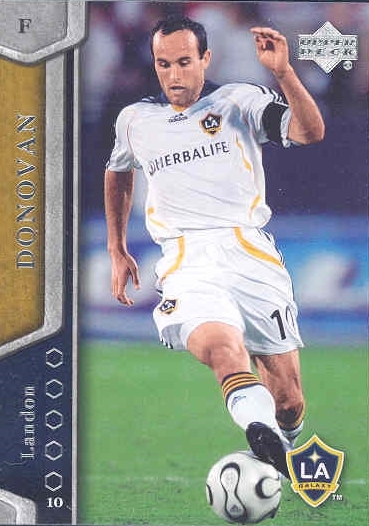 Landon Donovan, the all-star American, became non-existent. As a matter of fact, I don’t remember seeing him again on the broadcast. The same could have been said for one of the greatest players of all time, David Beckham . . . except for the fact he found the camera every single time play stopped. He was there if a player fell down, for a free kick, when the ref was calling a foul, and on and on. Talk about attention hog (too bad his on air time wasn’t doing anything for his team). Real Salt Lake was grinding it out like they did during their entire playoff run, relying on their legs to carry them until they were victorious . . . or they literally fell over from exhaustion. The grit and grind kept Real Salt Lake in the game. Robbie Findley scored for his team after a deflection off a Galaxy defender, and with the game tied at one apiece RSL showed they were the better squad. Their possession was dominant, their passes crisp, they had shots on goal and barely missed multiple opportunities in the end to win the game. Veteran and former Jamaican national team player Andy Williams fell over twice from exhaustion, and took his time getting up. At the end of the game his legs were so heavy he missed their final chance to win the game in overtime. He knew it. The team knew it. With the final whistle blown it was coming down to sudden death. Now for those who may not be familiar, during the regular season teams gain points based on their win-tie-loss record. But when it comes down to the championship, they need to declare a winner at the end. The game is split into two 45 minute halves. At the end of regulation, if the teams are still tied, the game continues with two more 15 minute halves which we call extra time. In the unfortunate event the game is STILL tied, the teams go into what is called a shootout. Each team is given five shots, one right after the other, at the opposing team goalie. Best of five wins. Confused yet? Trust me. This is where soccer appeal starts to lose its glisten among American fans. Fortunately, Real Salt Lake pulled off the win, but the Galaxy could have taken home the trophy just as easily. Even though RSL outplayed L.A. for more than half the game, it all came down to five shots. Five shots? We should have just had the shootout in the beginning and spared everyone the time it took to play the game. Can you imagine putting in all the hard work, getting to the finals, playing better ball and leaving the rest up to a roll of the dice? What a downer. I know many of you will argue it is just sports. Most of you can probably put together a long list of games where the outcome has been left to chance. I understand where you are coming from in most cases, but those arguments have to do with sports that have existed in America since before most of us were born. Soccer is still trying to make a name for itself. There are few third and fourth generation fans out there, but becoming a mainstream sport will take a lot more than just putting a few games on ESPN. The shootout definitely adds a tense moment to the game, but winning in regulation would have done far more for the popularity of the sport. I like the props Logan! I’m a RSL and Jazz season ticket holder! It was great to see my first Championship in my lifetime for the City and State! !